Ickwell v Marston Shelton. Picture: David Kay. With Shefford Town & Campton sitting Saturday out their Bedfordshire League lead is now down to just goal difference after Ickwell & Old Warden ran out 3-1 home winners over Marston Shelton Rovers. Lee Threadgold, Ashley Drummond and Conor Green netted the goals on The Green against a lone Rovers reply via Gary Russon. Now in third spot in the Premier Division supported by Sportsform, just three points adrift of the leading pair, are Caldecote who extended their winning away ways to three games with a 5-1 victory at Queens Park Crescents. Tom Wallace with a brace was joined on the scoresheet by an own goal plus strikes from Ricky Aris and Mokbui Ali against a lone Crescents strike from Shahinur Rahman. On the same number of points as Caldecote are Flitwick Town who missed the opportunity to climb up into second when beaten 2-1 at AFC Kempston Town & Bedford College. Josh Spavins and Taylor Bakogeorge were on the home scoresheet against a Town reply from Phil Matthews. However, the biggest win of the day belonged to fifth place Crawley Green Reserves. Just four points behind Shefford Town & Campton, and having played the same number of games, Green could well be Town’s biggest threat to this season’s league crown after they secured a 8-1 home win over Kempston Rovers Development. 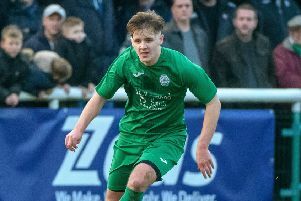 Nash Bennett with a hat-trick was joined on their scoresheet by Temitayo Akerele who netted twice plus Cameron Veazey, Jacob Younger and Tom Barnett who all netted once, the lone Rovers reply coming from Will Barnett. Just goal difference behind the Green in sixth place are Stevington who took their unbeaten ways up to seven games by winning 4-1 at Sharnbrook. Louis Green, Billy Roberts, Ben Walsh and Thomas McGirl all found the back of the net against a lone home reply from Richard Ball. For AFC Oakley M&DH who now hold down seventh spot it was a 3-1 home victory over Cranfield United. Elijah Hukin netted all three goals against a lone United reply from Ali Smith. Wootton Blue Cross halted their run of three straight home defeats by sharing the spoils in a 3-3 draw with Wilstead. Ryan Smith, Sam Halfpenny and Robbie Odell on the Blue Cross scoresheet against replies via Kieran Brasier twice and Hanvir Thirra once. With leaders Totternhoe Reserves sitting the afternoon out Riseley Sports missed the chance to top the table when they were held to a 0-0 draw at Henlow. Whilst preserving their seasons unbeaten away ways, the sole reason they failed to collect all three points can be summed up in two words - Jack Mannion, the name of the home goalkeeper who made a series of fine saves to keep them at bay. The biggest win of the day was to go the way of Cranfield United Reserves who netted a 4-1 home victory over Lea Sports PSG who were duly losing for the first time in eight league outings, the last five of which had be won. Ben Martin with a brace was joined on the United scoresheet by Joe Bygraves and Andre Anderson against a lone PSG reply via Joe Hennem. Enjoying life on the road for the third consecutive game were Biggleswade FC Reserves, 3-0 winners at Flitwick Town Reserves thanks to a brace of goals from Gianni Battezati and a single strike from John Veal. Also winning on the road were AFC Kempston Town & Bedford College Reserves who won 2-1 at Cople & Bedford SA. Elliot West from the penalty spot plus Charlie Corcoran netted the vital goals against a lone home reply from Gary Canzano. The clash between the bottom two sides was to go the way of home side and second from bottom of the table The 61FC Luton Reserves who beat Meltis Albion 3-1, Kane Dempsey netting twice and Kieran Archer once against a lone Albion strike from Fabio Esposito. Like in the top two divisions, the leaders in Division Two Henlow Reserves were sitting the afternoon out and their lead at the head of the division is now down to just a single point after Bedford Albion netted win number five on the bounce with a 3-0 home victory over Houghton Athletic. Matt Phelan, Adam Lewis and Antony Foreman netted the goals. Whilst third place Wilstead Reserves were gifted three points when Westoning failed to raise a side to travel to meet them at Jubilee Playing Fields. Elsewhere, Atletico Europa were to suffer their seventh consecutive away defeat when beaten 1-0 at Elstow Abbey who with a goal from Mark Allen just before half-time were returning to winning ways for the first time in five home outings. The lone away winners of the day were Caldecote Reserves who are now unbeaten in their last seven outings after winning 3-2 at CS Rovers. Adam Legate, Josh Wilson and Nick Thomas were on their scoresheet against a brace in reply from Rovers Daniel Bhatti. Whilst for Luton Leagrave AFC and Sundon Park Rovers it was a share of the spoils from a 3-3 draw. Lewis Bloomfield with a home hat-trick seeing his goals cancelled out by a brace from Ethan Tenn and a strike from George Norton for the Rovers. There is no change at the head of Division Three following wins for the top two sides. Kempston Athletic stay four points clear after extending their unbeaten ways up to 11 games in chalking up home win number six on the bounce in beating Lidlington United Sports 2-1, Craig Damon and Luke Mongiovi on the Athletic scoresheet against a United reply via Tom Staples. Whilst second place Harlington, who have played one game fewer than the Athletic, took their unbeaten ways up to 12 games with a 1-0 home victory over Shefford Town & Campton A thanks to a strike from Dan McMillan. The biggest winners of the day were Stevington Reserves who won 6-1 at AFC Kempston Town & Bedford College A, Liam Donovan leading the way with a hat-trick to go alongside single strikes from Regan Scott, Tony Riley and Fabio Cammanro against a lone reply via Giovanni Moscartio. Whilst just a goal behind them were Black Swan the 5-0 winners at bottom of the table White Eagles. Ben Smith with a brace was joined on their scoresheet by Joe Grossi, Callum Greene and Levi Yearwood to bring up the nap hand. For Sandy Reserves it was home win number three on the bounce with a 4-0 victory over Bedford Albion Reserves. Matt Johnson with a hat-trick plus a strike from Aaron Seldon did the damage. Also winning on home soil were Flitwick Town A who ended a run of three straight defeats by beating Wootton Village 1-0, Luke Snapes the Town goalscorer. Clifton will now face a Quarter-final home tie against Flitwick Town A after beating Caldecote A 3-2. Dylan Donaldson with a brace plus Josh Adams netted the goals against Caldecote replies via James Whitmore and Jim Fuller.